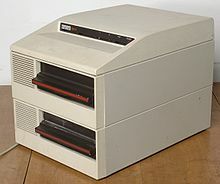 DEC's 32-bit successor to the PDP-11, the VAX (for "Virtual Address eXtension") overcame the 16-bit limitation, but was initially a superminicomputer aimed at the high-end time-sharing market. 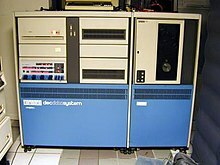 The early VAX CPUs provided a PDP-11 compatibility mode under which much existing software could be immediately used, in parallel with newer 32-bit software, but this capability was dropped with the first MicroVAX. 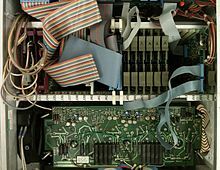 PDP-11/44 – A replacement for the 11/45 and 11/70, introduced in 1980, that supports optional (though apparently always included) cache memory, FP-11 floating-point processor (one circuit board, using sixteen AMD Am2901 bit slice processors), and commercial instruction set (CIS, two boards). It includes a sophisticated serial console interface and support for 4 MB of physical memory. The design team was managed by John Sofio. This was the last PDP-11 processor to be constructed using discrete logic gates; later models were all microprocessor-based. 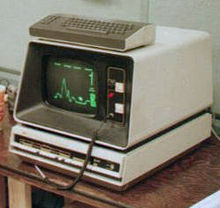 It was also the last model produced at Digital Equipment Corporation. ^ a b Bob Supnik (August 31, 2004). "Simulators: Virtual Machines of the Past (and Future)". ACM Queue. 2 (5). ^ Jeffrey R. Harrow. "My, How Far We've Come". Archived from the original on 2016-03-03. ^ Frank Rose. "Into the Heart of the Mind: An American Quest for Artificial Intelligence". 1985. p. 37. ^ "The Development of the C Language" in section More History, by Dennis M. Ritchie. Accessed August 5, 2011. ^ "Oral History of Edson (Ed) D. de Castro" (PDF). Retrieved 13 July 2017. ^ McGowan, Larry. "How the PDP-11 Was Born". Retrieved 2015-01-22. ^ a b "16-bit Timeline". microsoft.com. Retrieved November 8, 2016. ^ a b Fiedler, Ryan (October 1983). "The Unix Tutorial / Part 3: Unix in the Microcomputer Marketplace". BYTE. p. 132. Retrieved 30 January 2015. ^ a b Hinnant, David F. (Aug 1984). "Benchmarking UNIX Systems". BYTE. pp. 132–135, 400–409. Retrieved 23 February 2016. ^ "Press Release re transfer of Operating Systems". Groups.google.com. Retrieved 2014-04-14. ^ a b Ritchie, Dennis M. (22 June 2002). "Odd Comments and Strange Doings in Unix". Bell Labs. ^ "Development Project Report" (PDF). Archived from the original (PDF) on 2016-04-12. Retrieved 2014-04-14. ^ Bruce Mitchell; Brian S. McCarthy (2005). "Multiprocessor FAQ". Machine Intelligence. Retrieved March 9, 2018. ^ Don North (February 7, 2006). "Original 11/74 front panel". cctech (Mailing list). Archived from the original on July 18, 2011. ^ "Digital MINC-11". Binary Dinosaurs. Retrieved 2014-04-14. ^ a b HSC Controller Installation Manual (PDF). Digital Equipment Corporation. July 1991. p. 4-28. EK-HSCMN-IN-002. ^ VAX 8500/8550 System Hardware User's Guide. Digital Equipment Corporation. 1986. pp. 1–8. ^ Ákos Varga. "TPA-1148". Hampage.hu. Retrieved 2014-04-14. ^ Ákos Varga. "TPA-11/440". Hampage.hu. Retrieved 2014-04-14. ^ "CalData_brochure" (PDF). Retrieved 2014-04-14. ^ a b c d e f g h i j k "The PDP-11 FAQ". Village.org. 2000-04-18. Archived from the original on 2015-03-21. Retrieved 2014-04-14. ^ "Communications Options Minireference Manual, Volume 5, Ethernet Devices (Part 1)" (PDF). Digital Equipment Corporation. August 1988. p. DECSA-1. EK-CMIV5-RM-005. ^ Leveson, Nancy G., and Clark S. Turner. "An Investigation of the Therac-25 Accidents." Computer July 1993: 18-41. ^ Richard Chirgwin (June 19, 2013). "Nuke plants to rely on PDP-11 code UNTIL 2050: Programmers and their walking sticks converge in Canada". Retrieved June 19, 2013. ^ Claremont, Bruce (February 2008). "PDP-11 Replacement Keeps the Navy's MSDD Spinning" (PDF). Retrieved October 15, 2017. ^ Aubert, J.J.; et al. (November 1974). "Experimental Observation of a Heavy Particle J". This page was last edited on 26 April 2019, at 00:46 (UTC).